On the surface, Carson Rouse seems like an average 16-year-old boy. He is the wide receiver and linebacker for the football team of McKinley High School in Sebring. He spends his time playing video games with his friends. He’s busy studying for final exams this month to complete his sophomore year. But when you ask Carson what he likes to do in his spare time, he’ll tell you he’s interested in entrepreneurship and that he is the CEO of his own business, Legacy Book. At his website, BookYourLegacy.com, customers can create a customized hardback book about their lives by answering an extended questionnaire. Carson got the entrepreneurial bug by watching the TV series “Shark Tank” with his brother, Rob Rouse Jr., and his father, Rob Rouse Sr., who enjoy brainstorming their own business ideas together. Pictured: Carson and Rob Rouse Sr. The idea for Legacy Book came about seven months ago when Carson was watching a video on YouTube channel Vsauce. The videos on the channel cover an array of topics featured to educate and entertain viewers, including science, psychology, mathematics, philosophy, gaming and cultural topics. In one video, host Michael Stevens asked viewers if they could name 10 people who lived in the 14th century. It got Carson thinking. After watching the video, Carson told his dad and brother about his idea to create a personalized book that would help tell the story of someone’s life. “When I brought up this idea, we all agreed it was a great idea and that we wanted to pursue this one,” Carson says. Although the family has never pursued one of their business ideas until Legacy Book, they have participated in other business endeavors such as eBay drop shipping. For this, Carson and his brother bought items in bulk from a supplier and then sold the item to a buyer on eBay at a higher cost than what they bought it for. With his father’s help, Carson used the money he saved from this and other small jobs to start his business. Now when the Rouses get together for Saturday lunch, instead of brainstorming startup ideas, they work on how they can improve Legacy Book. First, they had to decide what questions they thought people would want to know the answers to about their loved ones. “We had to think creatively and that was hard because we wanted to think of questions that would cover the span of an entire life without them being too long because that would drive people away,” says Rouse Jr.
His title is vice president of Legacy Book. Customers can type as much or as little detail as they want in the spaces available on the website after each question. The questions are separated into nine chapters of the book: The Beginning, Family Roots, Extended Family, Childhood, Love & Marriage, Starting a Family, Work & Career, Passions & Pastimes and Future Plans. For each chapter, a customer can attach a picture that goes with the theme of the chapter. Carson’s brother is studying computer science at the University of Akron where he is a freshman. He helped to create the website for Legacy Book. A Legacy Book is available for $39.99 with free shipping. Rouse Sr., who has worked as the sales manager at Abrasive Supply Company in Minerva 16 years, helped Carson start the business by setting up appointments at four book binding companies in Cleveland. The Rouses visited the companies and Carson ultimately decided which one to go with. “This is the best quality book that any of the book binderies were offering and it’s an affordable price,” he says. When someone places an order, the answers and pictures for the questionnaire are emailed to Carson. Carson then transfers the file into a PDF and sends it to the bindery to manufacture and ship to the customer. Carson made his first Legacy Book prototype by filling out the questionnaire with answers his grandfather gave him. “We told him the questions were for a school project and then surprised him with the book and he thought it was a cool idea,” Carson says. The black cover on the book has gold letters in the center that read, “Bob Rouse,” his grandfather’s name, along with “Legacy Book” in the bottom right corner. Carson flips to a page under the Love & Marriage chapter in his grandfather’s book, which shows a black and white photo of his grandparents’ wedding picture. Legacy Book is different from other companies with a similar idea because it is the first of its kind to do online customization, Carson believes. 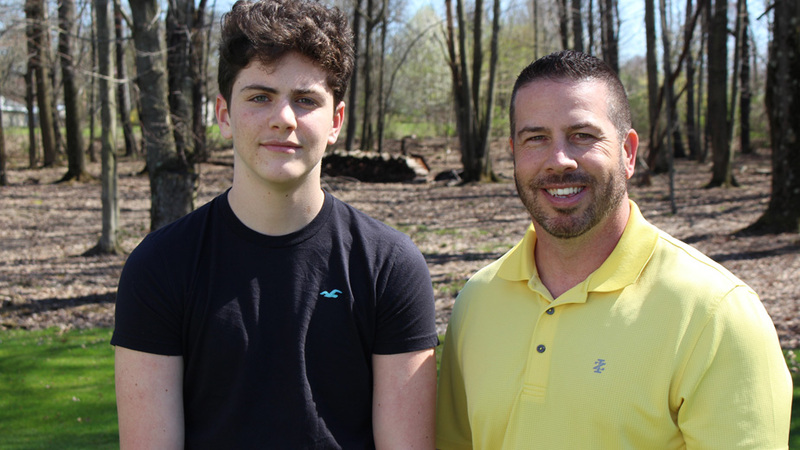 Just a few weeks ago, Rouse Sr. told his friend Derek Egli about the business his son started and it sparked Egli’s interest. Now a resident of Sebring, Egli spent many of his younger years traveling the world while in the military. A couple of the places he visited for extended periods were Alaska and Ecuador. Another interested customer, Renee Barkley, says she wants her mother to fill out a book since there are questions she read on the website that she doesn’t know the answers. Barkley wants to fill out one herself to give to her children, too. The next step the brothers want to take to improve the business is work on marketing it through social media. Rouse Jr. uses YouTube videos and reads articles to learn how to use Facebook ads, he says. Next fall, Carson Rouse will enter the business and marketing program at Mahoning County Career and Technical Center in Canfield.